Want to feel like you're cruising at light speed? 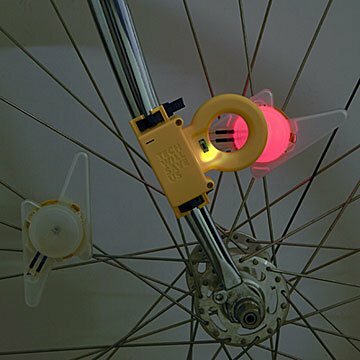 Build your own wireless bike lights with this STEM kit. What's the fastest thing in the universe? Hint: It's even faster than your bike. The answer is light, and this kit lets you harness it. It comes with everything you need to build your own beams, strap them on your bicycle spokes, and use wireless electricity to get 'em glowing. An interactive way to teach kids about technology, making the lights is part one of the fun. Part two, creating lightning-like flashes with every pedal, makes you feel like you're traveling about 186,000 miles per second. Made in China.